You are here: Home / The Best Website Builder For Your Website / Weebly vs Wix Compared: Which Website Builder Is Best For You? 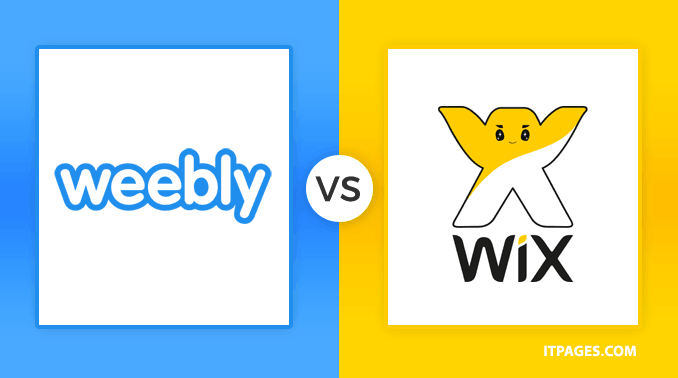 Weebly vs Wix Compared: Which Website Builder Is Best For You? Weebly is a very simple website builder to use, but Wix also keeps DIY websites on the easy side. While both may trade a few features to maintain that simplicity, Weebly and Wix in general have a good mix of features, particularly for the less technically inclined. So then, which one is best? What website builder offers more for the inexperienced website owner, Weebly, or Wix? Further to our review of Weebly and review of Wix, we put to the two options side by side in a Weebly vs. Wix comparison so you can find out which one suits your needs best. 6 Weebly: Who is it best for? 7 Wix: Who is it best for? 8 So, who wins? Weebly or Wix? If simplicity is the biggest priority, Weebly and Wix become some of our top recommendations. Both are What You See Is What You Get (WYSIWYG) editors, no programming knowledge necessary. If you can create a document on Word or a slideshow on Powerpoint, you can build a website with Weebly or Wix. On Weebly, several options are automatically set up for you, based on a few quick questions at the beginning. For example, if you say that you are opening an online store, Weebly will automatically designate your home page as your storefront page that displays products. If you want the homepage that you see in the Weebly theme you chose, stick with a general website (you can still add a store page too). To edit an option, just click on it. To add a new option, just find it in the toolbar and drag and drop it to where you would like it. While Weebly is easy to use, the Wix editor looks just like the actual website with a toolbar and toolbox added in. To edit an option, just click on it. You can even use the navigation bar to edit a different page, just like you would to visit a different page. While many of the elements are automatically added, you can drag more in from the toolbox. It'd be tough to make Wix any simpler. It's tough to compare Weebly and Wix in terms of ease of use, since they are both very simple to use. A new, inexperienced website owner could create a successful website on either platform, though Wix feels a tad easier. Wix has a simpler set-up that looks almost exactly like the actual website. Weebly gets a head start in terms of design right off the bat because it allows users to change their design theme later, where once you choose with Wix, you're stuck (unless of course, you want to start again from scratch). That's important in the long-term view of things, since a later re-branding or trend changes years down the road may necessitate a new theme. The platform offers over 100 different themes, and many of them are modern and well-designed. Finding one that suits your needs is easy too since themes are searchable by colors and style. Wix has a good selection of themes as well, though some are only available with the more expensive monthly plans. There are plenty of modern designs, and users can search by industry type to find an option that's well-suited for their needs. There's one-page options as well as choices for multiple-page websites. Choose carefully though, you can't change your template later on. Wix also has an unusual design option where users can add animation to their website. Really though, the animations don't look professional and are best avoided anyway. Design-wise, Weebly, and Wix are nearly neck and neck. The ability to change your website theme later makes Weebly better in the long run, though Wix has some excellent templates across multiple industries. Both Weebly and Wix are designed as multi-purpose websites, including an eCommerce option. While not as full-featured as websites that are designed specifically for eCommerce like Shopify and Bigcommerce, they have a surprising feature set for multi-purpose website builders. Weebly has an excellent storefront that allows customers to apply filters to their search results. Store owners can customize automated emails, for example, confirming an order or shipment updates. The program will also help track inventory, and export those lists as a CSV file or to Intuit Quickbooks. Even options like coupons are also available. However, you'll need the $20 a month option in order to set up shipping options, so don't go into it expecting to use the cheapest plan. Wix has a good variety of storefront features as well, though not quite as many as Weebly. The eCommerce is easy to get set up, and an introductory video walks you through the steps. Wix includes options like coupon codes. While Wix owners can send out emails to customers on Wix through an app, they aren't automated like on Weebly. Products also are more limited, for example, you can only add up to two variations (like size and color for example). Weebly is preferred over Wix for an online store, though each platform would get the job done. The ability to send automated emails and the ability to allow customers to search by filters makes Weebly a bit nicer for eCommerce. As more budget-friendly website builders, both Weebly and Wix offer a surprising amount of features. Weebly has more options built-in, however, where you can do some of the same things with Wix, but through downloading a third party app. For example, you can easily add a block of HTML code to any website on Weebly, but you have to use an app to do that on Wix. Of course, finding an app to add those features is just one more thing to add to the to-do list, so feature-wise, our preference is for Weebly. That's not to say Wix is really lacking in features, though. Both platforms offer responsive designs, which instantly adjusts a website based on what device the visitor is using, so it looks good even on a smartphone. Both also offer blogging tools built-in. Weebly is the more affordable of the two options. You can use it for free—but custom domain names without the “.weebly” come in at the $3.29/month package. For eCommerce, the $20/month option is necessary for options like setting up shipping costs. Wix doesn't come in much higher, though. The basic option is just a few cents more at $4 a month when paid annually. In order to use the eCommerce features, users need either the $16 or $25 option, with more features on the $25 package. Weebly is a very simple platform to use, so it's a good option for users that find options like Squarespace and Shopify a bit too much. Where Wix relies on a lot of apps, Weebly has more features built right in. It's affordable and well-suited for a variety of different business types. Wix is among the simplest website builders that we've tested. The website builder looks almost exactly like the actual website, with the exception of the toolbox and toolbar. While it's simpler than Weebly by a small margin, there are fewer features built-in. Wix is a good option for those looking for a simple website with minimal fuss. So, who wins? Weebly or Wix? Weebly has more features for a lower price, but Wix has better quality templates. While it may be a bit simpler to get started on Wix, Weebly is the option with the most features for the best price. To decide for yourself, signup for a free account and take Weebly for a test drive.